Do you know what it is to not be able to read and write? Many of you may answer in the negative. But stop and think about it for a minute. What would you miss most if you were unable to read and write? We take for granted our ability to read and write yet there are millions of people (adults and children) around the world who are unable to read and write. 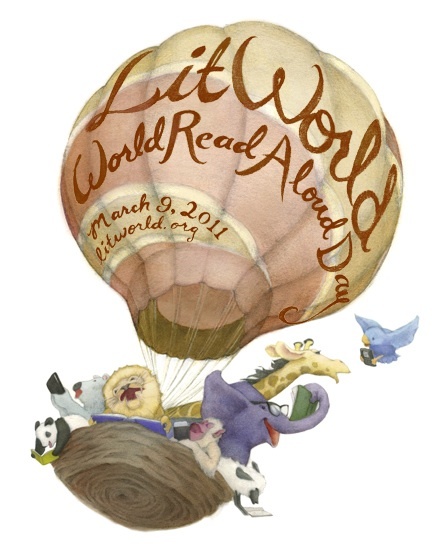 To make the world aware of this, World Read Aloud Day (March 9, 2011) was started by LitWorld. It is a pledge to read 774 million minutes in support of the 774 million people around the world who cannot read or write. Reading aloud to those children around you; at home, in the classroom, at weekend school or the community centre (create more excitement by logging the minutes spent reading – see Reading Tally sheet). Or host a read-a-thon. So, what would you miss most if you could not read or write? Looking forward to reading your thoughts and feelings in the comments below! A mailbox in your home? A fun way to encourage reading and writing. Have you ever thought about having a mailbox in your home or classroom? It can be the start of a fun and easy way to get your children involved in writing, and reading too! Adults and children are spending longer hours on the computer (and sadly also in front of the television) and less time with books and papers and pens. Writing anything, especially if it’s beside assigned school work, has become a chore to many children. While we enjoy the convenience of email; we should also take time to show children how good it feels to write a letter/greeting card. Encourage them to send post cards and greeting cards to their family and friends and I am sure they will enjoy receiving a reply. This simple activity on a regular basis will encourage children to express their thoughts and write them down. Younger children can draw and colour as their way of input. But what about a mailbox in your home? How would that work? I’ve had one in my home off and on for the last year and a half. It adds another dimension to communication between my child and my hubby and I. Basically all it involves is writing letters to each other using the mailbox as the central point for holding and collecting the mail. The mailbox is easy to make; a shoe box or cereal box can work (children would have fun decorating it). Here is how the mailbox works. Write a letter to your child and put it in the box. He collects the ‘mail’ and reads it; for younger children the parent can read the letter out loud to them. Then your child writes a reply and put it in the mailbox. Now it’s the parent’s turn to check the mail. He/she reads the letter (alternatively you can have your child read your letter to you). you can also use the mailbox to share artwork, memos, jokes, quotations and even comics clipped from the newspapers. The mailbox idea works well with older children and even teenagers. It provides the opportunity for each person to express their thoughts and feelings in a way they may not when speaking directly to each other. Through this mailbox activity you have automatically involved your child in the process of both reading and writing. In addition, not only is this ongoing activity fun, it provides you and your children with the opportunity to grow closer through spending time together and in sharing your thoughts and ideas. So is the mailbox idea something you’d try in your home to get your children reading and writing? Maybe you’ve done something similar. Please share your ideas and experiences in the comments below. I’d love to hear from you!